When asked about the ongoing Today show drama, Rivers, 79, shocked HuffPost Live host Marc Lamont Hill by laying into Curry. Curry, 56, left the show last year amidst rumours that co-host Matt Lauer was behind the departure. 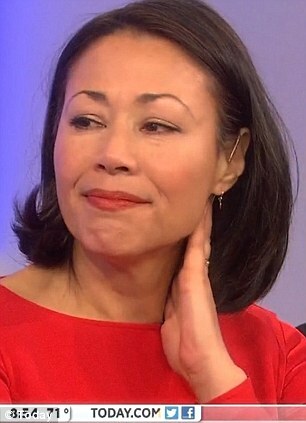 And Joan didn’t hold back, she said: ‘Ann Curry? With all due respect–’ and then made a snoring sound. 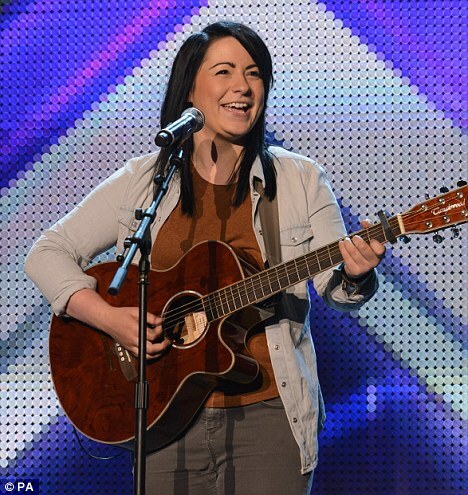 She was one of last year’s favourites to win The X Factor, until she had to bow out of the competition due to illness. But when Lucy told her fans that they hadn’t seen the last of her she wasn’t wrong, as she’s just signed a major record contract with Columbia. The singer/songwriter is set to release her debut album later on this year as well as a headline UK tour next month. Lucy was picked for the singing competition last year after getting a standing ovation while performing her self-penned track Last Night. She was then put through to live shows by mentor Tulisa but ultimately finished in ninth place after dropping out due to ill health. The 21-year-old from Sheffield has clearly been busy since her X Factor exit, putting in the studio hours so that her album will be ready this year. ‘I’m really excited to be working with Columbia, it is such a respected label with an incredible heritage,’ said Lucy. ‘To be signed to the company who have worked with great icons like Johnny Cash, Bob Dylan and Bruce Springsteen and the newer generation of artists like Calvin Harris and Rita Ora is amazing – I can’t wait,’ she added. Proving her enduring popularity, Lucy’s tour has already sold out with six extra dates now added due to popular demand. ‘Lucy is a refreshingly honest and naturally gifted storyteller who walks to the beat of her own drum,’ said Co-President of Columbia Alison Donald. Mille Mackintosh Shows off engagement ring! Reality star Millie Mackintosh and Hackney-born rapper Professor Green are engaged. The Made In Chelsea star, 23, tweeted a snap of her dazzling engagement ring by Frost of London on Monday evening, with the touching caption: ‘If I could scream loud enough for the whole world to hear I would.’ Her ring is made up of a typically large rock set on double bands encrusted with diamonds. Earlier in the day the brunette had shared with told her Twitter followers that her beau whisked her away to ‘her favourite restaurant in the whole wide world’ – in the famously romantic city of Paris. The couple have been dating for over a year, after the 29-year-old Professor – real name Stephen Manderson – became enamoured by the reality star when he saw her cover shoot for FHM two years ago. By the end of 2011 he had her number and they debuted their relationship at the BRIT Awards 2012 ceremony. At the beginning the longevity of the union was doubted by critics who said Quality Street heiress Millie was simply after ‘a bit of rough’ with her rapper boyfriend. His response to her acceptance to his proposal on Tuesday was just two words on Twitter: ‘Happy days.’ However, the typically jovial rapper did send his sympathies to two Hollywood starlets who would undoubtedly be rather disappointed by his new relationship status. 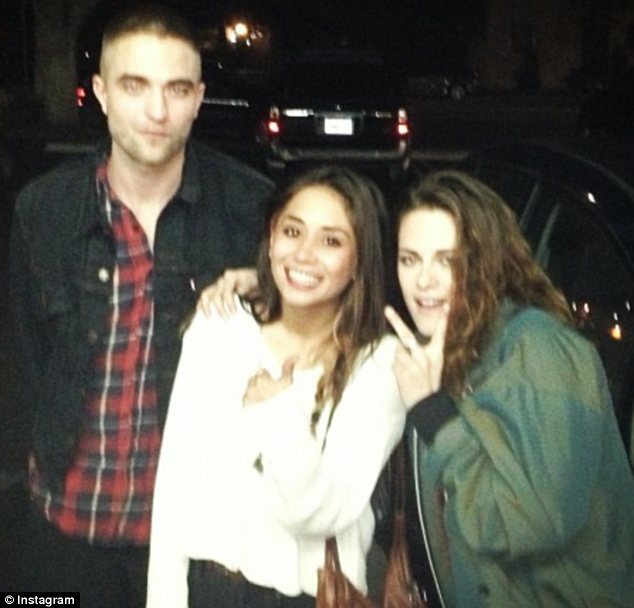 He tweeted: ‘Someone’s gonna have to break the news to Jessica Alba and Eva Mendez (sic)’. Luckily the rapper’s DJ friend Lewis Richards offered to ‘look after them now.’ For Millie, some of the first people to share their congratulations were her Made In Chelsea castmates. Francis Boulle tweeted: ‘Congratulations to @millsmackintosh and @professorgreen on their engagement. Nice ring. 😉 #Weddingbells’. As the CEO of a jewellery company, his reference to the ring could suggest he may have helped the Professor in the selection process. Jamie Laing was far simpler with his excited message: ‘@professorgreen @millsmackintosh congratulations guys!!!! X’. But it seems Millie and her new fiancé may have overdone the celebrating somewhat, with the reality star tweeting on Tuesday morning: ‘Wow ive got a little bit of a headache this morning! #toomuchchampagne.’ The pair also set tongues wagging when they shared a broody picture of themselves cooing over a friend’s baby over lunch. She said: ‘Definitely no baby, not right now. Like any girl, I know I want a family one day, but I’m really focused on work at the moment. ‘But Herby my dog has made me feel maternal. I love looking after people, but it’s a lot of responsibility. It’s like a little taste of having a first child.’ Professor Green, who split from Hollyoaks actress Candy McCulloch in November 2011, admitted he had been seeing a lot of Millie before they made their public debut, but initially said he wasn’t looking for ‘anything serious’. When Millie met Pro Green, she was overcoming heartache herself after she discovered her boyfriend Hugo Taylor had cheated on her with best friend Rosie Fortescue. But for the couple who have made no secret of their growing love for one another over Twitter, it was a definite fitting place for their happy announcement. She was forced to cancel two dates on her Diamonds World Tour after suffering from a bout of laryngitis earlier this month. And Rihanna has now reportedly been told to curb her party-loving lifestyle if she wants to fulfill her touring commitments. After bowing out of the Boston and Baltimore legs of her epic seven-month tour, the 25-year-old singer is said to be taking the advice of doctors, who expressed concerns about the effect her late nights, smoking and boozing could have on her overall health. A source said that : ‘Rihanna’s illness was so severe that doctors warned it could take months for her to fully recover – there were worries that she’d have to cancel her entire tour. Those close to the We Found Love hitmaker have also claimed she has recognised that her recently rekindled relationship with Chris Brown – who was charged with assaulting the Bajan beauty prior to the Grammys in 2009 – may not be having an entirely positive effect on her. In addition to cancelling two dates on her tour, Rihanna arrived on stage in Toronto, Canada, 70 minutes late last week. 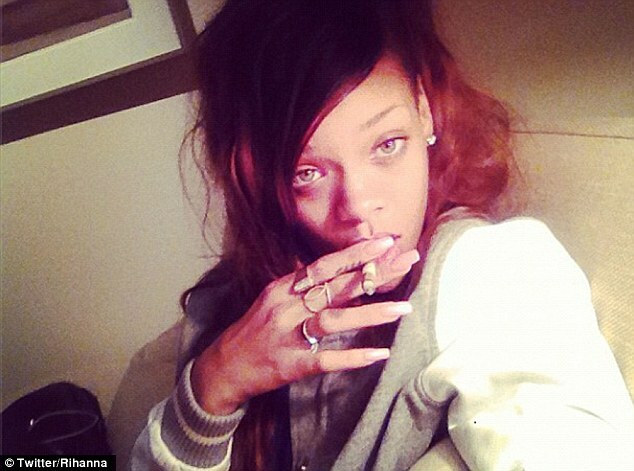 Meanwhile, marijuana was discovered on one of her tour buses at the Canadian-Michigan border, according to TMZ. Authorities stopped a total of 10 buses at the Ambassador Bridge, which separates Windsor, Canada and Detroit, but Rihanna was not believed to be present at the time. Officers cited a man on one of the buses with a civil penalty after finding him in possession of a ‘small quantity’ of the drug. According to the website, border inspections initiated a bus-to-bus search after smelling marijuana and sniffer dogs were brought in and made a beeline for a man, who is understood to be part of Rihanna’s tour crew. This is by no means the first time the hard-partying star has been told to take care of herself, after being rushed to hospital with ‘exhaustion and dehydration’ following a string of wild nights in May 2012. The Diamonds World Tour wraps up in October in Auckland, New Zealand. The Wanted have been living the dream since filming began on their reality television show. But some of the lads clearly haven’t been taking advantage of the superb weather in the States. Singer Jay McGuiness was the biggest culprit as he stripped down to his swimming shorts and exposed his very pale body. The boys were in Las Vegas, Nevada, at the Bare Pool Lounge at The Mirage Hotel and Casino, but it looked like Jay had not been sunbathing in a very long time. Surrounded by a large number of female admirers the British boy band were living up to their party hard reputation as they stood around socialising with cups of beer in their hands. Meanwhile, Tom Parker had no issues with his tan as he showed off his well toned and tattooed body. With the presence of alcohol at the party the boys could be forgiven for only drinking a little bit, but Tom admitted that he doesn’t care if he is filmed being drunk. Tom said: ‘I’m not bothered about seeing myself drunk on camera I’ve seen it before on camera phones. To make sure that he looks picture perfect for his close-ups on camera, Tom has had a little a bit of work done to achieve that Hollywood smile. He said: ‘For us we don’t really take out image too seriously. I have my teeth whitened by Dr Wyman Chan at Smile Studio London, that’s about it.’ Viewers can also expect to see a familiar face making an appearance too providing her stint in rehab doesn’t clash with filming. Tom told MailOnline: ‘We all get on so well with Lindsay, she’s a great girl. Kelly returns to Fashion Police! She suffered a seizure on March 7, and spent five days in hospital. So 28-year-old reality star Kelly Osbourne was understandably delighted to be given the all clear to return to life as normal and her beloved job on E!’s Fashion Police on Wednesday. The British presenter was spotted out and about on Sunday looking well and happy after her medical mystery, but her Tweet suggests she’ll be back in the studio on Thursday. Kelly, the daughter of rock god Ozzy Osbourne collapsed in seizures for 30 seconds on the set of Fashion Police while speaking with guest Melissa Rivers. ‘Kelly has returned home and has been given a clean bill of health by her doctor,’ her spokesperson told E! News in a statement on Tuesday. The former Dancing with the Stars contestant took her Twitter to thank the medical team behind her recovery.